This post is part of Amy Johnson Crow's 52 Ancestors in 52 Weeks for 2018. The prompt for the week of January 15, 2018, is "Longevity." We like to say in my family that the women on my mother’s side live a long time, and they age well, too! Sadly, my mother’s own mother died at the age of 59 of breast cancer a few months after I was born. My mother is currently 92 and says she’s going to reach 100. I told her to go for it! Her sister Catherine is about to turn 87. 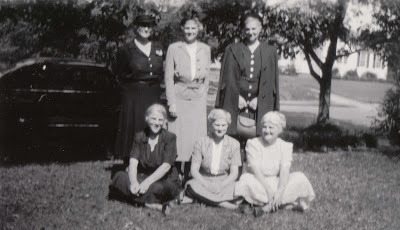 Most of their maternal aunts (my great aunts) lived to their late 80s or into their 90s: Kathleen lived to 94, Maie Dell lived to 89, Margaret lived to 93, and Mary Remer (Dinah) lived to 89-1/2. The back of this photo says "Edmund's wedding. The aunts." Seated, left to right: Mary Remer (Dinah), Margaret, Stella. Probably taken in the late 1940s or early 1950s. Both of my dad’s sisters lived into their 90s: Clyde was 96 and Frances was 91. I’m sure there are other people in my family tree who were long-lived. I was fortunate to have known all these ladies while growing up. I hope the longevity gene was passed down to me!